I have been writing some articles to help expand my vision in the world of adventure. After looking through them I decided to post one on my blog. It is a great read and I hope you like it. Winter weather can bring a variety of outdoor recreational activities that summer doesn’t. Ice fishing, ice skating, cross country skiing and snowboarding are great activities that can only be done in winter. There are also some year round activities like horseback riding, hiking and hot springs that are great to experience in the winter. It’s winter and going to a beach may be the best trip ever. Even the prime areas are less crowded with fewer tourist. You will experience the authentic feel with the locals and maybe see things that are geared mainly for the tourist season. You won’t be competing for the best campground spots, restaurants and activities. Even the little things will be better, like less trash, more firewood, less noise, and fewer people on trails. All these things can make traveling in the winter even more enjoyable. If you enjoy sitting around the campfire, gazing at the stars, drinking cocoa and eating smores than winter camping with long nights will be a special pleasure for you. Winter enhances your senses, allows you to see stars that you have never seen and truly enjoy the deep quiet of nature. This tranquillity is something summer travelers will never really get to experience. Glamping is a new form of camping, in case you didn’t know. It is where stunning nature meets modern luxury. It's a way to experience the untamed and completely unique parts of the world—without having to sacrifice modern comforts like TV and a bed to sleep in. 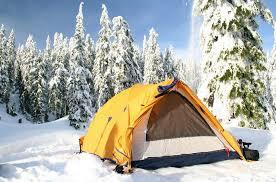 Glamorous camping is another word for this activity and if you do it in the winter you can have heat! But don’t worry cause you can still brave the cold weather to roast marshmallows over a fire. I hope you liked my article. Please give me some feedback so I can keep writing.